Magellan - "Hundred Year Flood"
Magellan is the brothers Gardner, Trent on keyboards and vocals and Wayne on guitar and bass, with Joe Franco pounding the skins. 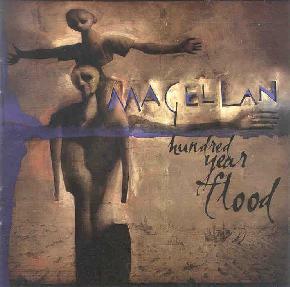 Hundred Year Flood is their fifth album. As I listened to this band, I was reminded of another American progressive rock band from the 70’s, Kansas, especially in their earlier period. Indeed, Trent Gardner has worked with Steve Walsh, who was the vocalist for that band. But early Kansas may only be a starting point. Magellan, like their historical namesake, forges ahead, starting in familiar territory, and searching for something new. This is certainly most evident in the album’s centerpiece, the 35-minute epic The Great Goodnight. Composed as a tribute to their older brother who was killed in the Vietnam war, The Great Goodnight is something unusual in progressive rock: a intricate musical rock epic that is emotional and deeply personal. This works both to the piece’s advantage and to its detriment. I have to give Magellan points for trying something this ambitious, and in some respects, managing to pull it off. Where it works best is in the complex vocal arrangements. Trent Gardner has a powerful and versatile voice, showcased especially in the amazing 2-minute a cappella opening. Vocals of this style recur throughout The Great Goodnight, though in later parts with instrumental backing. The playing is top notch, without being “show-offy”. And although Trent Gardner’s vocal phrasing is occasionally awkward, it does ring with sincerity. The problem is, is that the emotional impact of such personal lyrics is often diminished in a genre of music that focuses on complexity and virtuosity. I keep wondering, am I supposed to be listening to the performance, or to its content? So, it doesn’t always work, but I have to hand it to the Gardner brothers for trying. And it’s still a very enjoyable piece of music. The remaining two pieces on the album, though not directly related to The Great Goodnight, carry with them a consistent theme of family and caring for others, though in a less personal sense. Family Jewels is an instrumental, played mostly on the keyboards, but featuring a lengthy and shifting flute solo at the beginning from Jethro Tull’s main man, Ian Anderson. The rest of the piece is certainly dynamic, but tends to amble a bit without really getting anywhere. Much more successful is the album closer, Brother’s Keeper, one of the best prog rock songs I’ve heard in a while. Checking in at 9 ½ -minutes, it shifts from a Kansas-like opening of strumming acoustic guitars, lovely vocal melody, and violin (which, from reading the credits, was actually probably Trent creating the sound on keyboards) to a muscular and pounding mid-section that brings a kind of funky street cred to the genre of prog rock, in both it’s heavier parts and lighter acoustic sections. All parts considered, while it doesn’t always work, I’d still recommend Hundred Year Flood as one of the more creative and adventurous progressive rock albums of the year. Contact via snail mail c/o Magna Carta; PMB 1820; 208 E. 51st St; New York, NY 10022-6500.